Trosyl Nail Solution is used to treat infections of the fingernails and toenails. We can prescribe Trosyl online for next day delivery. 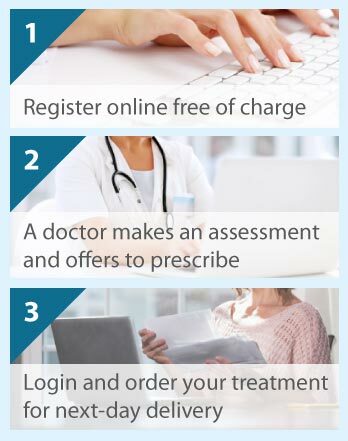 All you need to do to get started is complete a quick online consultation that will be reviewed by one of our doctors. What is Trosyl Nail Solution? Trosyl Nail Solution contains an anti-fungal agent called tioconazole. It is active against fungi and yeasts, and some bacteria. Tioconazole interferes with the production of essential components of fungal cell membranes, which causes them to become more porous. In this way, the treatment prevents the growth and functioning of the fungal organisms. Trosyl Nail Solution is a topical liquid preparation. Using the supplied brush, the solution is thinly applied to the entire affected nail and the skin around the nail every 12 hours. Allow the solution to dry for about 10 to 15 minutes. Note that the solution will not completely dry and leaves a clear oily coating. The coating contains the active antifungal agent, which then penetrates the nail to get to the fungal infection. It is important not to disturb the coating for as long as possible, so that you gain full benefit from the treatment. Do not wash the treated area immediately after application. Water only will not remove the oily coating but soaps and detergents will (it is advisable to use rubber gloves if treating your fingernails). Usually, the treatment is applied for up to 6 months but it can be up to a year. Trosyl Nail Solution is for external use only. Do not put it in or near your eyes. If you swallow this medicine by accident, contact a doctor immediately. Who can use Trosyl Nail Solution? Trosyl Nail Solution can be used by children, adults, and elderly people. Women who are pregnant should not use this treatment, and those who are breastfeeding are also recommended not to use it. Trosyl cannot be used by individuals who are hypersensitive to tioconazole or any other ingredient of the solution. Tell your doctor if you are allergic to other medicines used to treat infections caused by fungi. Commonly, swelling of the hands and feet and, less frequently, an itchy rash around the treated nails has been reported. These effects are usually mild and temporary, occurring when you start using the antifungal solution and disappearing within a week. If you suspect an allergic reaction (itchy, dry, or blistering skin, especially on your face), then stop applying the treatment and get medical advice immediately.